​Michael and I met in 1993 when, on a dare from a friend, I answered an ad in the paper looking to train dance instructors - no experience required! At the time, it was just a whim, but it turned into a passion that we have enjoyed together for the better part of the past 25 years. Not too long after we met (Michael was managing the studio and hired me! ), we opened Impressions Dance Club. We taught, trained, competed, and performed for several years before settling in Oregon. During the next few years, Michael won numerous top teaching awards, and Impressions won top school awards as a competitive dance studio. 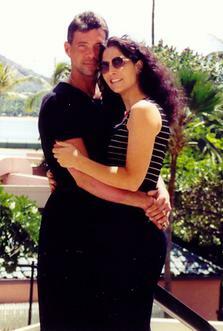 In 2001 we won the Rising Star Rhythm Championship at the Hawaii Star Ball in Honolulu. Shortly after that competition, as the economy shifted and strained, we eventually shifted our focus from competitive dancing to social dance, and focused on couples wanting to have fun learning an activity they can do together. With our own children now in elementary school we also began working on dance education programs for school age children. In 2002 we started producing programs for school assemblies and teaching for the DARE Program in Tigard. By 2004 we'd held our first elementary school dance program and competition. Cynthia also began teaching at Lewis & Clark College. In just a few short years we've had the opportunity to teach thousands of students in the northwest. Our children are now adults and we've moved on to our own individual passions in our careers. Michael recently did all of the renovation inside Leedy Grange Hall where we teach, and turned it into a beautiful facility for us to hold classes as well as an event location for the community. He continues to work on construction and renovation projects. I've continued with my children's programs in the schools, as well as teaching fitness and body image classes. And we still enjoy dancing together. Admittedly we both have for more white hair now, than the dark hair from our performing days you see pictured - but isn't it fun to see a blast from the past?! We still very much enjoy teaching private lessons and group classes for couples on a weekly basis, and hold bi-monthly community dances at Leedy Grange in Cedar Mill. Our focus is on teaching couples how to have fun connecting by learning to dance together. We love that most of our students come regularly to classes and dances for their date night, and to socialize with the other couples they have become friends with through the studio. We teach American Style Social Dance and enjoy creating new steps, and encouraging creativity on the dance floor. We specialize in people with three left feet who have no rhythm, and we believe that anyone can learn to dance if they truly want to learn. Above all,we believe strongly in having fun first, and then worrying about the rest of the details that make the dancing look great. American Style Dance is reminiscent of the days of Fred Astaire and Ginger Rogers. The open style of the movement allows partners to separate and then return to the closed dance position. We enjoy the freedom of movement American Style Dance allows and have fun putting our own personality into every dance. It is our goal to help our students learn to do the same so they too can enjoy dancing as much as we do. Several years ago I started teaching a dance-aerobic class at the Lakewood Center for the Arts, in Lake Oswego. Since I'm not big on the regular form of aerobics classes, with the standard grapevines and kick-ball-changes, I started teaching more of the forms I found more interesting, and borrowed heavily from the ballroom dances I know and love, and from the stage musicals I love to watch. Our class has become a highly stylized series of dances to usually non-traditional exercise music, but definitely danceable fun all the way around. Not to mention, we're a wonderful group of women who have become great friends, laughing and dancing together, and supporting each other through all of life's ups and downs. We waltz, we tango, we samba and cha cha. We swing up a storm, and jazz and vamp all over the place. The class is for anyone who ever loved being a dancer,anyone who ever wanted to be a dancer, or anyone who ever just loved dancing and wanted to dance more. For years we've joked about putting on a show. Recently we had the opportunity to do so, when one of our class members, who is the president of the Lake Oswego Newcomer's Club, invited us to attend the auction the club was hosting for Meals on Wheels. We had great fun flash-mobbing one of our routines to kick off the dancing for the night! We hope to recreate the fun and the flash again this September at the CARE TO DANCE fundraiser to benefit Care Partners. This summer we'll be putting many of our class routines, including All About That Base, on video so everyone can join us in the future, or just have fun dancing at home. Watch for more details to come, and if you ever have the chance to join us on a Monday, Wednesday, or Friday morning at 9:00am at the Lakewood Center for the Arts, we'll all be glad to have you there.